The other day my friend Brooke, from the Evanston Chamber of Commerce, mentioned he was starting a blog about ties and wondered if I could knit him a tie. I'd never knit a tie before, but how hard could it be? I took on the challenge and gave it a couple nice personal touches: a seed stitch border and a single cable down the center. 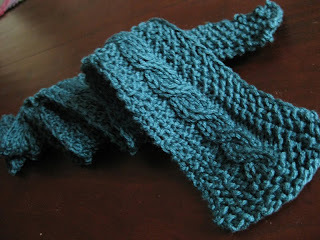 I used Tahki Yarns Cotton Classic, which has a nice sheen to it, as well as being very sturdy. I also took some notes so I could write up the pattern for you here! c2f - slide 1 stitch purlwise to cable needle and hold to front, knit next stitch from left needle, knit stitch off cable needle. Repeat cable rows 1-6 seventeen times, then work from 1-3 once. After row 3 of the cabled area, you'll be starting on the wrong side (ws). 4 and 5: Repeat rows 2 and 3. 10 and 11: Repeat rows 8 and 9. 18-29: Repeat rows 14-17 three times. Work those two rows until they equal the length of the first part of the tie. Bind off. I made my husband a tie over Christmas - this one looks perfect for his second one. Thanks for posting the directions! As the aforementioned Brooke, I cannot wait to wear it as part of my 100 Days, 100 Ties blog project. 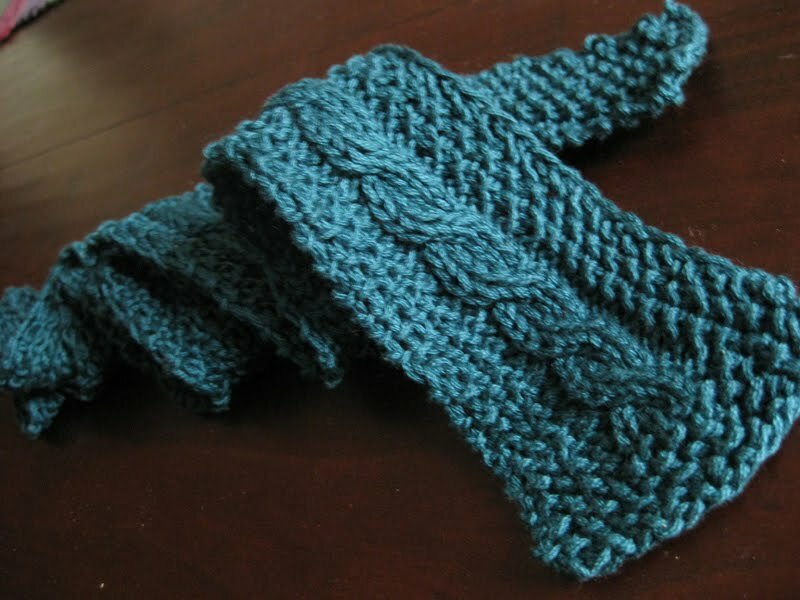 I was truly touched by Sarah's generous gift, and now, seeing the pattern (it's all Greek to me) and its intricacy, am completely amazed by this world of knitting. I'll be wearing it early next week...Thanks again Sarah!